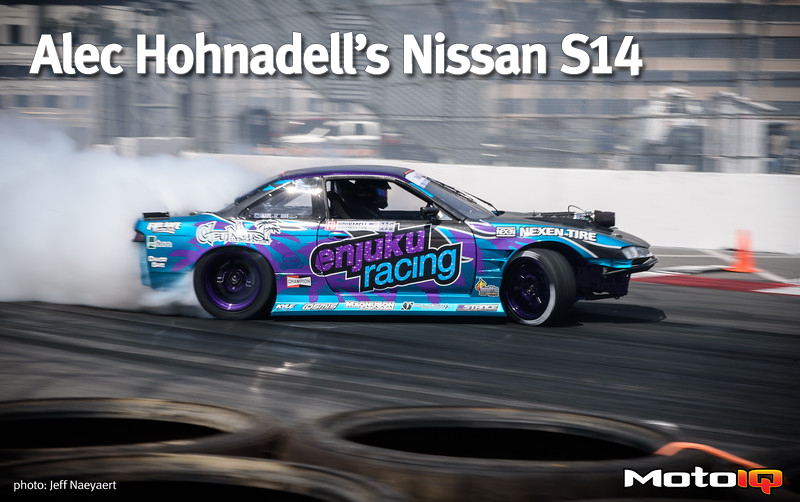 Do you want to see a future Formula Drift Champion? Look no further than Alec Hohnadell. At only 20 years old, Alec already has 3 seasons as a pro under his belt and is the youngest driver in Formula Drift. Alec was born to compete, he began racing motocross at the age of 4 and had seen over 100 podium finishes until he transitioned into racing jet skis at the age of 14. There he won 7 national championships and one world championship. At 16 years of age, Alec attended a local drift event and fell in love with the sport. After six months of drifting at local events, Alec entered the Streetwise Pro-Am drift series and podiumed at every event! With this, he managed to win the Pro-Am Championship. Alec decided to skip Pro 2 and go straight to the super competitive Pro 1 series and compete with the big boys at the tender young age of 17. Only Ken Gushi was younger when getting a pro licence. Last year Alec got his first podium at the Seattle FD round. For this year Alec decided to step up his game and build a state of the art pro car. He enlisted the help of Forrest Wang’s Get Nut’s Lab, the builders of some pretty damn pretty and competitive cars to create the beauty features on these pages. Let’s check it out! The heart of the S14 is a potent Chevy motor built by Golen Engine that starts with the extra stout GM Motorsports heavy duty cast iron LSX block.